If you’ve got young children, you’re probably searching for a good preschool near Pembroke Pines. Attending preschool is important for development, as it teaches children valuable skills that they will use in kindergarten and throughout their education. Early learning sets the foundation for how your child will develop as a student and as a person. Watch this video to learn more about what to expect from a preschool curriculum. In preschool, kids learn social skills such as how to converse with others, and gain experience in everyday social interactions. Preschool teaches kids how to follow a routine and work as part of a group. Children learn about letters, numbers, and shapes as well as how to write basic words and their names. Before your child begins kindergarten near Pembroke Pines, he should attend preschool at an early childhood education center near you . The majority of early childhood development occurs before the age of five, and a preschool program can encourage and facilitate your child’s cognitive, academic, social, and emotional development. Your child will be better prepared for kindergarten and his future academic career if he attends a preschool program at an early childhood development center. Watch this video for some great tips on choosing the right preschool program for your child. Jennifer Kaywork, Ed.D., the professor of teacher education at Dominican College, discusses the importance of an early childhood education. 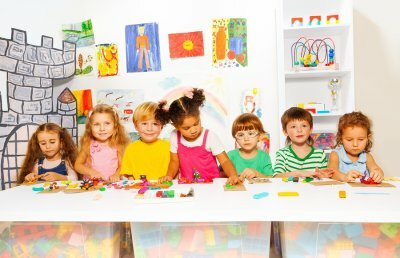 Arts and crafts projects play an important role in early childhood development. Not only do they inspire creativity, but they also help develop fine motor skills and even pre-math skills. If your little one is in preschool or kinder care near Pembroke Pines, you can watch this video to see a demonstration of a holiday art project. This child care expert demonstrates how she has her kids create a holiday tree out of construction paper, sequins, and glue. Red construction paper serves as a festive background for the tree. This day care expert provides kids with six strips of green paper of varying sizes. The preschool-aged kids work on their pre-math skills by placing the strips in order from largest to smallest. Then, they can glue them in place to create a holiday tree, which they can decorate with glued-on sequins.